Midge is a common term for many types of small fly. They are all in a suborder, the Nematocera. They are found on practically every land area except permanently dry deserts and the frozen zones. 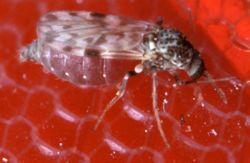 Some midges, such as many Phlebotominae (sand fly) and Simuliidae (black fly), are vectors of various diseases. Others are prey items for insectivores, such as various frogs and swallows. The highland midge of Scotland (Culicoides impunctatus) is present in huge numbers. It is a significant blood-sucking pest. It is found in upland and lowland areas (fens, bogs and marshes) especially in the north west of Scotland from late spring to late summer. also known as no-see-ums or punkies in North America, and sandflies in Australia. ↑ Merritt R.W. & Cummins K.W. (eds) 1996. An introduction to the aquatic insects of North America. Kendall/Hunt Publishing. This page was last changed on 2 October 2018, at 18:26.